About Andrea M. Message Andrea M.
TOUR GUIDE RESPONSE: Thank you !!! Best regards, Andrea M.
TOUR GUIDE RESPONSE: Dear All, Thank you so much for such a nice review! I also enjoyed being your tour guide in Budapest! Enjoy the rest of your stay in our wonderful city and have a safe trip for home! Best regards, Andrea M.
Andrea M was the perfect tour guide to do the historical Jewish Tour of Budapest. She is incredibly intelligent, informative, passionate, compassionate and knowledgeable about the subject of Jewish history from the Austrian Hungarian empire until the present day. Our focus was on the late 19th century through World War I and II until present day Hungary. Her family dates back generations and she was able to give us personal perspective as well. We highly recommend this tour. TOUR GUIDE RESPONSE: Hi, Thank you very much your kind words! I also enjoyed being your tour guide in Budapest. Take care, Andrea M.
This was a clear and informative tour. Andrea explained the history of Jews in Budapest, answered questions and gave us an insight from personal experience. This was a great addition to our cruise . We enjoyed our time spent in her company. TOUR GUIDE RESPONSE: Hi, Thank you so much for your kind words. It was my pleasure being your guide in Budapest. Enjoy your cruising! Best regards, Andrea M.
Andrea M was the best guide EVER! She made our adventure in Budapest beyond anything Nathalie (French) and Patricia (American) could have ever dreamed of! THANK YOU Andrea and I look forward to seeing you again on another tour in the future! We will return! TOUR GUIDE RESPONSE: Hi, Thank you sooooo much for the very kind words! It was my pleasure being your tour guide in Budapest! Take care and best regards, Andrea M.
My husband and I absolutely loved this tour. As soon as we met Andrea, we felt like we had always known her. She has a very friendly and warm personality. Her knowledge of the history of the Jewish culture and Hungary was amazing. We also saw how the Jewish community has a thriving presence in this area today. Andrea is an outstanding guide. Her tour was the highlight of our visit to Budapest. We highly recommend taking this tour with Andrea. TOUR GUIDE RESPONSE: Hi, I was so happy reading your review! Thank you! Best regards, Andrea M.
Andrea met us at our hotel and right away we new we were in for a wonderful tour. She is extremely knowledgeable, passionate, and immediately made us comfortable. We probably could have spent days with her just listening to her talk about the Jewish Heritage of Budapest and Hungary. I would highly recommend Andrea as a guide who will provide a special understanding of her city and country. A terrific experience. TOUR GUIDE RESPONSE: Hi, Thank you for the kind words! I also enjoyed being your tour guide in Budapest! Best regards to all of You, Andrea M.
We were fortunate to connect with Andrea for a full day tour of Jewish Budapest in September 2018. She was wonderful in all respects - knowledgable, personable, and patient with our many questions. In many respects this was a pretty comprehensive tour of the city, not just the downtown area, but with the Jewish context. We saw many synagogues and other relevant sites and learned a great deal about the experience of Jews in Hungary. This tour really contributed to our time in Budapest. TOUR GUIDE RESPONSE: Hi, It was nice to read your wonderful words about my tour. Thank you! Take care, Best regards, Andrea M.
TOUR GUIDE RESPONSE: Thank You for choosing me and my tour! Best regards, Andrea M.
This was a wonderful tour of Jewish Budapest. Andrea was so knowledgeable and so in tune to what we were wanting to learn. We would absolutely recommend her as your tour guide. We met two lovely ladies on our ship that coincidently also used Andrea for their tour of Jewish Budapest. She had been recommended to them and she had been recommended to us. We live in Florida and they live in California! So from one end of the US to the other, she is known and highly recommended. That says it all. TOUR GUIDE RESPONSE: Hi, Thank you very much for the kind words- it was nice to hear from the other dear Clients, as well ((-: It was a pleasure being your tour guide in Budapest! Shanna Tova and take care, Andrea M.
We are very interested in learning Jewish history and culture in Eastern Europe, and fortunately found Andrea in Budapest, thanks to Tours by Locals. Andrea has infinite knowledge of Hungary's history and presents it as it relates to Jews and their culture. Its very personal for her and this makes the tour even more special. Her knowledge of Budapest the city, is so helpful too. Overall this was a terrific tour and one we will never forget. TOUR GUIDE RESPONSE: Hi, Thank you for the kind words! It was my pleasure being your tour guide in Budapest! Take care, Andrea M.
Andrea is an amazing guide! We learned so much from her deep knowledge about Jewish life in Hungary, her articulate and nuanced descriptions about recent and past history, and her enthusiasm for her subject. Andrea gave the sights we saw invaluable context. She also is warm and friendly, and she shared her personal history and experiences as well—just what one would wish from a local guide. She left us with so much to think about. TOUR GUIDE RESPONSE: Hi, Thank You so much for the kind words! Wishing all the best for you and your wonderful son! Best regards Andrea M.
We learnt a lot from Andrea's knowledge about the history going back several hundred years. Fascinating what happened to Hungary as well as the contributions from and impact on the Jewish community. I strongly recommend Andrea who will show you not only the key areas but put them into perspective of the history. This makes the places we saw come alive and much more interesting. TOUR GUIDE RESPONSE: Hi, Thank you for the kind words! It was my pleasure being your tour guide in Budapest. Take care and enjoy the rest of your vacation! Andrea M.
Andrea was a wonderful guide with a deep knowledge of Hungarian Jewish history. She walked us through the history of the Jews starting with the oldest medieval synagogue to the largest remaining synagogue in Europe. Our teenage granddaughters were able to have an understanding of the European Jewish history beyond the history books, their triumphs and their tragedies. TOUR GUIDE RESPONSE: Hi, Thank you. I am happy you were satisfied. Thank you for recommending my tour to other travelers. Take care, Best regards, Andrea M.
An excellent tour. Our guide, Andrea, was friendly and really knowledgable of the Jewish Heritage in Budapest. I would strongly recommend this private tour. Andrea M. was extremely pleasant and knowledgeable about the Jewish history of Budapest. TOUR GUIDE RESPONSE: Thank you! It was nice meeting you today! Best regards and enjoy your cruise! Andrea m.
Andrea provided an exceptional tour of Jewish Budapest, providing a complete history and covering all the important sites, including the Glass House. She also provided a driver, which was great for seeing everything, especially in the steamy weather we've been having. As a Jew herself, we were able to discuss the current Jewish community, not just history, which we found very interesting. Highly recommended. TOUR GUIDE RESPONSE: Hi, Thank you so much for your very kind words! It was my pleasure being your tour guide in Budapest! Take care, Best regards, Andrea M.
TOUR GUIDE RESPONSE: Hi, Thank you very much for your kind words. It was a pleasure being your tour guide in Budapest. Take care, Andrea M.
We learned so much from our guide about the history of Hungary and how it impacted the lives of the Jewish people. Andrea shared some personal experiences that really impacted the telling of the story of her country. Wonderful guide! TOUR GUIDE RESPONSE: Thank you! Take care, best regards to all of You, Andrea M.
Andrea was amazing. Very knowledgeable and friendly. Loved her tour. Thank you Andrea for spending time with us and showing us Jewish Budapest. TOUR GUIDE RESPONSE: Hi, Thank you very much for your kind words! It was my pleasure being your tour guide in Budapest. Take care, Andrea M.
TOUR GUIDE RESPONSE: Hi, Thank you for the kind words! It was a pleasure being your tour guide in Budapest! Best regards and take care, Andrea M.
TOUR GUIDE RESPONSE: Hi, Thank you very much for the nice words! I also enjoyed being your tour guide in Budapest today. Enjoy the rest of your stay here! Take care, Andrea M.
TOUR GUIDE RESPONSE: Thank you (((-: It was my pleasure meeting you in Budapest and being your tour guide here! Nancy Saxer (Barry Pope) S.
We had a better understanding of Budapest & Hungary after this tour which focuses on Jewish heritage within Budapest. The tour and specifically Dohany Street Synagogue is "unique" - a "must see for anyone, regardless of faith. There is a tremendous amount of history discussed about Budapest Hungary also. Tour Guide is very flexible and articulate. Highly recommend this guide & tour. Andrea was prompt. She was clear about what we would be seeing. We felt safe and comfortable in her car. She provided us with a lot of personal anecdotal information that made the tour even more interesting. It felt like we were being guided by a knowledgeable friend. I would not hesitate to recommend Andrea. Andrea is passionate about her Jewish heritage and the sites she took us to. She is warm and knowledgeable about her city and her English is wonderful (we had no trouble understanding her). We heartily recommend her. Andrea was so friendly and knowledgable and tailored our tour to exactly what we wanted. I only wish we had had more time to do a longer one. TOUR GUIDE RESPONSE: Thank you for the kind words! Best regards, LeShana Tova! Andrea M.
TOUR GUIDE RESPONSE: Thank you ((-: Andrea M.
Andrea gave us a great lour of Budapest. She was on time, She smiled and gave us a quick overview of the day and then we we were off. Her knowledge of the history was excellent. She took us to several areas that we would never have seen or even known about. Seeing the foundations of a Synagouge that was from the second century after Christ. 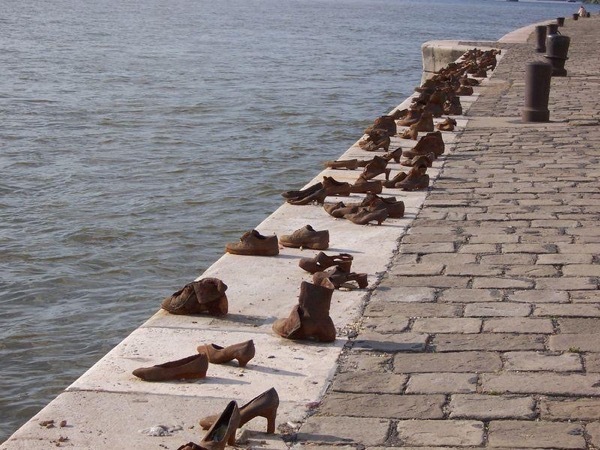 To understanding the way people died along the Danube because they were Jewish. And to understand that it was their fellow Hungarians that did this. TOUR GUIDE RESPONSE: Hi, Thank you very much for your kind words. I was happy hearing you enjoyed the day tour with me in Budapest. I assume it was a little misunderstanding - the Sy foundation I pointed out was from mid 13th century but that is correct I spoke about Jews living here already in the 1st cent. ((-: Thank you for choosing my tour, Take care and hope to see you in Budapest again in one day, Best regards, Andrea M.
Lovely and informative tour. Andrea was incredibly well-informed and interesting. Andrea was fantastic! Her knowledge level is superior. Our tour was filled every minute with a wealth of knowledge. She had the answers to any questions we asked . We felt we got the VIP tour! TOUR GUIDE RESPONSE: Hi, Thank you for the great review! It was my pleasure being your tour guide in Budapest. Best regards, Andrea M.
Great tour. Excellent guide. Very knowledgable and insightful. Goes beyond the Jewish Quarter and brought us to Shoes on the Danube memorial and the Glass House - areas most guides don't go to. Andrea was a wonderful guide she was so knowledgeable and answered all our questions on the tour of the Jewish Quarter. She was punctual and friendly and very accommodating during our 4 hours together. We never felt rushed and she was attentive and patient when we wanted to stop to eat. I would recommend Andrea to anyone looking for this type of tour in Budapest ��. TOUR GUIDE RESPONSE: Hi, Thank you very much for the kind words! I also enjoyed being your tour guide in Budapest. Best regards, Andrea M.
Excellent tour. Andrea customized as requested and focused on our interests. She even recommended a great restaurant for lunch. TOUR GUIDE RESPONSE: Thank you! I am happy that you also enjoyed the restaurant. Take care and best regards, Andrea M.
Andrea offered us one of the best tour experiences in Budapest. We were lucky to find her and would highly recommend her. TOUR GUIDE RESPONSE: Hi, Thank you soooo much for your very kind words. Take care and best regards, Andrea M.
Andrea's rich commentary and guidance made this a wonderful tour! I highly recommend her! We really enjoyed Andrea's tour. It was just what we were looking for. We wanted to know the history plus a bit of the behind the scenes that you won't get from tour books or anywhere else unless you are a local. The tour was paced nicely and we enjoyed it from start to finish. Third time we have used "TBL" and each guide has been excellent. TOUR GUIDE RESPONSE: Hi, Thank you for your kind words! It was my pleasure being your tour guide in Budapest. Take care, Andrea M.
Andrea was a wonderful guide. She was easy to communicate with prior to the tour, confirmed our tour and showed up at the right place at the right time. Her English was excellent which is a plus. Her knowledge of the Jewish section is unbeatable. She gave us an excellent history of the synagogues and of the Jews in the context of time and place. She has a very warm personality, and she was very easy to be with and talk with. I would highly recommend Andrea for this tour. TOUR GUIDE RESPONSE: Hi Dear, Thank you so much for your very warm words! It was a pleasure being your tour guide in Budapest! Best regards, Andrea M.
Very knowledgeable, pleasant woman. She took us around Jewish area of Budapest. Included many stories of personal nature which brought the tour alive. Shared comments about Kosher restaurants and establishments for shopping. Would highly recommend Andrea. TOUR GUIDE RESPONSE: Hi, I was happy reading you enjoyed the tour. Thank you very much for your kind words! Take care, Andrea M from Budapest. If it is possible to give Andrea a 10 star rating we would do so. She is an excellent guide!!! Andrea is extremely knowledgeable and thoughtful. Right from the start she picked up on what we were most interested in and gave us in depth information and perspective. We had our two twenty-something daughters with us and they loved her! We highly recommend her!!! Andrea was great, my family of 5 was very lucky to be walking with Andrea, tour was very interesting informative, she was very engaging. I would highly recommend Andrea to my family and friends. Budapest is a beautiful city with lots of history, amazing food. I will definitely be back. TOUR GUIDE RESPONSE: Hi, Thank you so much for the wonderful review. Thank you in advance for recommending my tour to your friends and family. Best regards, Andrea M.
Thank you Andrea for the wonderful experience you gave us last week- trying to keep different ages interested in the same topic at the same time isn't easy but you managed that brilliantly and we came away with a true feel for Budapest before, during and after the second world war. This tour was the highlight of our stay! We had an absolutely fascinating day with Andrea. She was informative, passionate and knowledgeable. Getting the perspective of a local such as Andrea is very enjoyable, the day went really quickly. Thank you Andrea and Tours by Locals. We cannot recommend Andrea enough, she is a special person with whom we enjoyed a special bond. Simply outstanding! I highly, highly recommend this very deep and meaningful tour. Andrea's knowledge and passion made this the highlight our time in Budapest! Excellent tour! Andrea was friendly, knowledagable and the tour exceeded our expectations. Andrea was like a historian of the city of Budapest. She related well to us. As fellow Jews, we had a deep empathy for our ancestors and friend's parents who perished in the Holocaust. She explained all the history of the Synagogues and the Jewish quarter in great detail. Well worth the price! TOUR GUIDE RESPONSE: Hi, Thank you so much for your kind words. It was really a pleasure being your tour guide in Budapest. Take care, Best regards, Andrea M.
Andrea gave us a wonderful tour. Her enthusiasm and knowledge were impressive. She showed us the obvious and lesser known Jewish sites in her beautiful city. Her personal connection to the Jewish community of Budapest made so much difference. We highly recommend Andrea! We had an excellent tour. Andrea was knowledgeable, friendly and enthusiastic. We would highly recommend her. She filled in a lot of gaps that our guide of the previous day left out such as Buda being a Roman city. Andrea showed us what was important and brought it to life. We just returned from Budapest where we took a Jewish Heritage tour with Andrea which took a full day. I can honestly say she was one of the most informative, cordial and best tour guides I have ever had. I unconditionally recommend her. TOUR GUIDE RESPONSE: Dear All, Thank you very much for the wonderful words! It was my pleasure being your tour guide in Budapest. Take care, Best regards, Andrea M.
Andrea exceeded our expectations. Her explanations were great and gave new meaning to Jewish Budapest. Andrea's tour of the jewish quarter was excellent!! There were 5 of us, 2 adults and 3 kids in their 20's and we all learned something. Andrea has a personal connection to the history which makes the stories come alive. TOUR GUIDE RESPONSE: Thank you so much for your kind words! Take care! Andrea M.
Andrea was fabulous!! She was so enthusiastic about her country and heritage. We toured with her on a Friday and we knew she had to be home for Sabbath but she was very patient especially since we had two seniors ages 85 and 94 in our group. While we had booked this as a walking tour, it was towards the end of our trip and I knew my father-in-law couldn't do the walking. Rather that leave him behind, Andrea did arrange for a vehicle and driver to take us between stops. I highly recommend Andrea. In a word, Andrea was "outstanding". We could not have asked for a better guide to provide our Jewish Heritage tour. Andrea was both very personable & very knowledgeable, doing everything to take us through the Jewish Hungarian experience from medieval times, through the 1800s, 1900s & today. Toured at least 6 synagogues (including her own) & other relevant buildings/memorials/monuments. Also provided details about the buildings & Jewish life throughout the period. Excellent experience; highly recommend. TOUR GUIDE RESPONSE: Hi, Thank you very much for your very kind words! It was my pleasure being your tour guide in Budapest. Take care, Andrea M.
Andrea was a wonderful tour guide. We thoroughly enjoyed the time we spent with her. I would highly recommend this tour! Andrea is an intelligent and excellent tour guide. She is very knowledgeable and presents the information in a passionate and interesting manner. We very much enjoyed spending the day with her. I would highly recommend her. TOUR GUIDE RESPONSE: Hi, Thank you very much for your kind words. Take care and best regards from Budapest, Andrea M.
We had five guides on a two-week trip to four Eastern European countries. All but one were good, but Andrea was the very best by far. We spent two six-hour days with her and learned a great deal about Budapest in general, and Jewish heritage in particular. We visited two synagogues Andrea and her husband attended, feeling privileged to have this personal experience. She is truly a professional, with a warm personal touch. Highly recommended. TOUR GUIDE RESPONSE: Hi, Thank you so much for your very kind words! Take care and best regards from Budapest, Andrea M.
TOUR GUIDE RESPONSE: Hi, I was very happy receiving your kind words. It was my pleasure being your tour guide in Budapest. Best regards, Andrea M.
Andrea was delightful and very thorough in her presentation of Budapest. It was very heart wrenching to hear of the plight of the Jewish people, during WWII, through her eyes. She took exceptionally good care of our group of 6 adults, catering to our every need and request. Andrea could not have been more accommodating and informative. Money well spent! TOUR GUIDE RESPONSE: Hi, Thank you so much for your very kind words! Take care, Andrea M.
Very well spoken and passionate about her subject. I wish we had more time. Andrea was most knowledgeable and accommodating. Her understanding of the history and people had a real resonance and gave us a true understanding of the Budapest as well as Hungarian Jewish story. We could not have appreciated what we saw without her. Warm, articulate, tremendously knowledgeable, a perfect guide. Shared with us the Jewish Quarter as well as The Glass House and the Shoes Memorial. Insightful, accommodating, we can not say enough about how wonderful the experience was. Certainly gave us a strong feeling about Budapest, now and in the past. Thank you, Andrea! Andrea was fantastic. She went out of her way to show us all the highlights of Budapest. She was extremely knowledgable, and her SUV was very comfortable. She is very personable, and accommodating. She went past the time scheduled so that we could see everything we wanted, and she dropped us off where it was more convenient for us. Andrea is great, and I would recommend her to everyone who visits Budapest..
TOUR GUIDE RESPONSE: Hi, Thank you for comment! Best regards, Andrea M.
Andrea is so knowledgeable about Budapest, she brought the city to life in her descriptions and explanations! We had the best time with you Andrea and I will be booking you again next year when I return with my husband. You are an amazing tour guide, and a wonderful person too! Andrea was a wonderful guide, very knowledgeable and pleasant. Her tour was the highlight of our vacation, well worth the expense. Would recommend her to anyone who wants to learn about Jewish history in Budapest. Andrea was terrific. Not only was she an excellent guide, but her willingness to share the experiences of her family gave perspective to the history she discussed and made the tour come alive. If I visit Budapest again, I would take the exact same tour -- also with Andrea -- and further enrich myself. My wife and I thoroughly enjoyed the experience and would recommend this tour and tour guide unconditionally. It is my pleasure to be able to offer this comment. TOUR GUIDE RESPONSE: Hi, Thank you so much for your very kind words! I also enjoyed being your tour guide in Budapest. Take care, Best regards, Andrea M.
Andrea is exceptional. Her English is excellent and her interaction with us was amazing. Jewish Budapest took me by surprise. This tour is a must do. The city is beautiful in itself, but when you add this history and walk into these buildings with Andrea, you understand so much more. I wish I purchased more items to bring home, so now I have to do this tour again. I am looking forward to another tour, in another year, with Andrea. TOUR GUIDE RESPONSE: Hi, Thank you so much for your very nice comment! Waiting to see you in Budapest again! Take care and Best regards, Andrea M.
Knowledgeable and an excellent overview. Highly recommend this tour! TOUR GUIDE RESPONSE: Thank you very much for the nice words! Best regards from Budapest, Andrea M.
Andrea was a 5 out of 5. She was organized, intelligent, honest, personal, and knowledgeable. She was the perfect guide. My husband and I could not have asked for more. We were 110% happy with her. Thank you Andrea. TOUR GUIDE RESPONSE: Hello, Thank you so much for your kind words. It was my pleasure being your tour guide in Budapest. Take care, Andrea M.
We were very impressed with her knowledge of the places we were taken and the historical background. She prepared a full day tour for us of Budapest, well organized and easy to follow with detailed maps and descriptions. At the end of eight hours we were elated and tired, but had a very good perspective of the city, history and its people. Very highly recommended. Very knowledgable guide. Spent additional time as the subject was close to all of our hearts. A special thanks for caring. Only drawback was that she was a little difficult to understand. TOUR GUIDE RESPONSE: Dear Mr. Hill, I thank you for taking the tour around in Budapest with me. I also enjoyed the company of your wife and was happy to share with you personal stories. I wish I was able to give you a small sample of Jewish Budapest. All the best, Andrea M.
Andrea is an outstanding guide who is filled with information and shares in a passionate manner. She is extremely knowledgeable, thorough and the day flew by as she introduced us to many out of the way places we never would have seen to gain a true understanding of history and modern life as it exists today. We highly recommend her. TOUR GUIDE RESPONSE: Hi, Thank you for the superb rating! Best regards and take care, Andrea M.
We learned so much on our tour with Andrea. It was a very meaningful day and I would highly recommend spending the time to trace the history of the Jews in Hungary. Thank you Andrea. TOUR GUIDE RESPONSE: Thank you for your kind words! Shana tova! Andrea M.
TOUR GUIDE RESPONSE: Hello, Thank you so much for your nice words! Take care and best regards from Budapest, Andrea M.
Andrea has a tremendous knowledge which she shared in an easy and interesting manner, making the tour most memorable and personal. I would recommend her to anyone visiting Budapest and the Jewish Quarter in particular. Andrea is a terrific guide and her knowledge of history, particularly the history of Hungarian Jews, is impressive. Her grand tour of Budapest was interesting and fun for our whole family (2 adults and 2 teens). I am grateful to Andrea for showing us her beautiful city and for also helping me with some research for a book project. TOUR GUIDE RESPONSE: Thank you so much for the very nice review! Take care! Best regards from Budapest, Andrea M.
Andrea was an amazing tour guide. She did her utmost to give us an extremely comprehensive tour of the Jewish sites in Budapest. We would highly, highly recommend her to anyone who is interested in the Jewish history of Budapest. She really puts her heart and soul into this tour. Thank you so much Andrea. TOUR GUIDE RESPONSE: Thank you so much for your very nice review! I am happy if you enjoyed my tour. Take care and best regards from Budapest, Andrea M.
Andrea was a great tour guide. She was very knowledgeable and interesting. We all learned a lot about Jewish Budapest during our tour. I would greatly recommend Andrea. TOUR GUIDE RESPONSE: Dear Ricki, Thank you so much for the nice review! I am very happy if you enjoyed the tour. Best regards, Andrea M.
TOUR GUIDE RESPONSE: Thank you!! Take care, Andrea M.
TOUR GUIDE RESPONSE: Dear All, Thank you so much for your very nice comment. Take care and best regards from Budapest, Andrea M.
Andrea was a pleasure to deal with. Her knowledge was wonderful and her ability to engage our children brought history to life. She incorporated my specific requests to visit my family's home and workplace prior and following WW2 into our tour. I would not hesitate recommending her services. An excellent tour. The history of Jews in Budapest is a rich yet difficult story. Andrea has a good grasp of all the nuances, and took great care that I understood the people and places in context. I enjoyed the depth of Andrea's knowledge. In particular, her personal point of view brought life to the buildings and memorials. When I expressed interest in something about Budapest, she would accommodate me with a flood of information. I enjoyed this tour.